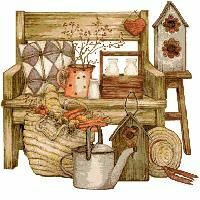 Cross stitch these symbols of simpler times and years gone by with this free counted cross stitch chart by Noelle Tibedeaux. The color scheme features lots of earth tones with splashes of muted color to create an appealing picture. The free chart is very detailed and broken down into several sections. Go here to get the instructions, color chart and detailed stitching chart. Happy Stitching!